Tokyo / E. Haddam, CT - After a 5 day competition between the world's leading soap bubble manipulation and performance artists, Connecticut native Casey Carle emerged as the bubble champion and crowd favorite in the latest episode of Nippon TV's most popular program: TV Champion, which will air to tens of millions of viewers next month. For 15 years "TV Champion" has put artists, craft persons and talent from many diverse professions head to head to see who is the best at their chosen skill. Past segments have showcased carpenters, gourmet chefs, architects and balloon artists. Carle was invited to take part as one of 4 masters of soap bubble manipulation and performance. TV Champion is the most popular program presented on Nippon TV, a national broadcasting station. Also invited on the program were two Japanese brothers, Heroyuki and Teroyuki Sugiyama, well known throughout Japan for over 20 years as bubble experts and entertainers. 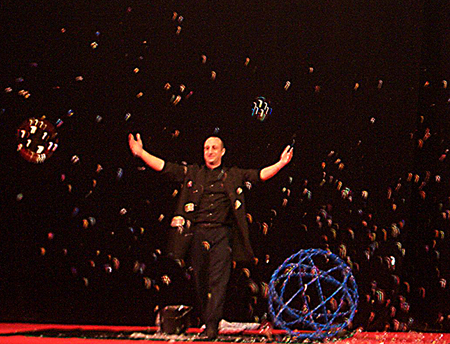 The fourth participant, Sterling Johnson from California, is a master of bare-handed bubble manipulations. The contest spanned 5 days and was divided into two rounds with a comedic host introducing and interviewing the contestants after each attempt and announcing scores and points awarded. The artists competed in a series of competitive games, such as an obstacle course and creating the longest bubble, and then a round of short performances judged by a four member panel of guest Japanese entertainers. The artist with the least points after these segments was eliminated from the competition. The remaining top three artists, Carle and The Sugiyama Bros., then prepared for the final round: a series of longer presentations on a theater stage in front of a live audience. This final segment, broken into 3 distinct performance "themes" offered the artists a chance to present their most amazing, most elegant, funniest or simply most unique soap bubble manipulations. Audience members voted for their favorite performances throughout the final segment. When the evening was complete Carle received over half the audience votes. Carle credits his win to his ability to not only present eye popping bubble manipulations but to do so with a professional polish developed over 15 years of bubbling and a sense of humor that transcends language barriers. Carle expects that once the program airs there will be other professional offers from entertainment agencies to perform at notable events throughout Japan and the Far East. Carle commends his fellow competitors for their participation. The amazing skills and camaraderie displayed on this program showed the Japanese TV audience that bubbles are less about competition and more about performance art that spreads joy and wonder worldwide. For more information on this event or Mr. Carle's accomplishments as a performing artist and entertainer please visit www.bubblemania.com. To contact Mr. Carle please call 860-873-9599 or email casey@bubblemania.com.